The man behind the name, "Fortune's Formula," is a living legend: Edward O. Thorp. In 1958 Thorp was a young, up and coming professor at MIT. He went to Las Vegas on a holiday vacation and experimented with a blackjack strategy about which he recently read. Thorp later taught himself Fortran and developed a methodology that could gain a verifiable edge over blackjack. He wanted to publish his work in the most prestigious journal that might take the article: The Proceedings Of The National Academy of Science. Articles had to be submitted by a National Academy member. Thorp knew fellow MIT professor, Dr. Claude Shannon, was the only academy member who was a mathematician. In November of 1960 Thorp presented his findings to Shannon via his paper "A Winning Strategy for Blackjack." Shannon liked the paper and agreed to submit it but suggested a name change to "A Favorable Strategy for Twenty-One." In early 1961 Thorp's paper was published and he was invited to present a version of it to the American Mathematical Society. Since the presentation was not for the National Academy, Thorp titled it: "Fortune's Formula: A Winning Strategy for Blackjack." 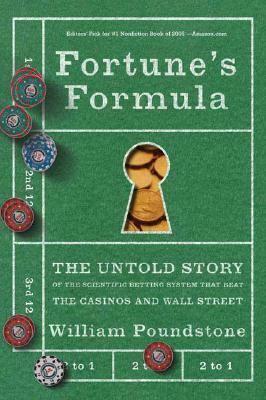 In 2005 William Poundstone published Fortune's Formula, a book that took creative license with the name since although the book briefly mentioned Thorp's original paper on blackjack, it was mainly about the Kelly Criterion.